The E-14 is the largest electronic exhibition in Denmark with about 158 exhibitors. About 2.800 persons visited the exhibition over the three days (2nd – 4th September), where Diatom, the preeflow distribution partner for Denmark, Sweden and Norway, presented die products of the brand preeflow. 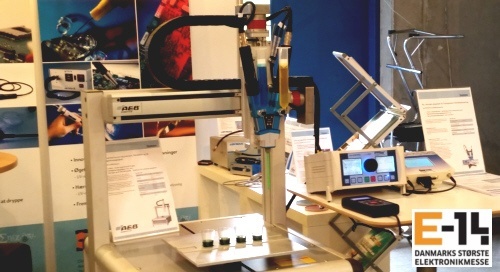 The eco-DUO600 and the AEB robot were placed in front of the stand and programmed to dispense blue and yellow shampoo in four small glasses placed in a row to illustrate the accuracy of the unit. This attracted many people’s interest and they were in fact impressed by its dosing accuracy.